Miriam wants lamb for her birthday dinner, but because of her TMJ she would like tender meatballs (kofta). 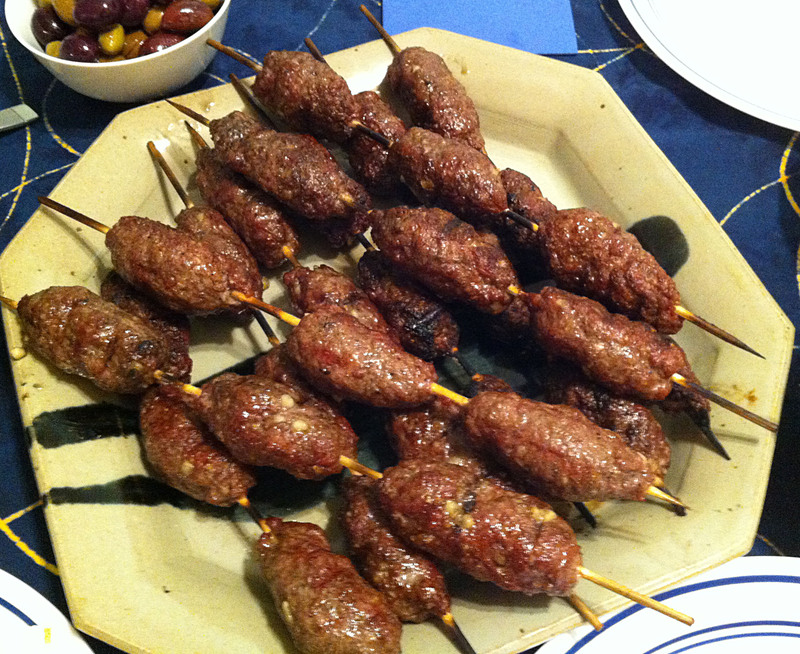 Variations of kofta are found over most of the Middle East, the Balkans, and throughout Central Asia and India. Miriam has asked for one of the simpler ones with various sauces. A common way to eat kofta is to wrap them in a sheet of lavash with fresh herbs, onions and a variety of sauces, like a Middle Eastern burrito. Lavash is very thin, soft flat bread, usually around 10 inches wide and 20 inches long. I decided to reduce the size of both the kofta and the lavash, so that my diners could try the different sauces I am providing. I am making my kofta about one inch in diameter and about two inches long. I also plan to cut each sheet of lavash into six pieces, (about five inches by six inches). Miriam was very specific about her desired sauces. She wanted a kefir/lime/mint sauce, a pomegranate chili sauce,and a sour cream/lemon sauce. I could not find any on-line that struck me, so I made my own to suit my mood. To complete my meal, I made a tomato, cucumber salad with quinoa and some stuffed mushrooms. The mushrooms did not turn out well enough to post. While the salad tasted well enough it was left begging for takers, because my dinners were all focused on the kofta. Jan made Claudia’s chocolate mousse for dessert. After Dinner Note: These wraps were so good that my other dishes were mostly ignored. When I make this dish again (and I have already had requests), I will make this dish by itself. A few olives, pickles and maybe a mint tea are really the only additions you need to make this a meal. 1. Soak the bulgur in one cup of water for 30 minutes and then drain well. 2. Toast the cumin, coriander and pepper corns in a small skillet until fragrant, about 2 minutes over medium heat. Grind the spices to a powder. 3. Put the bulgur, ground spices, lamb, garlic, salt, and baking soda into a large mixing bowl. Tip: Using warm water will both help dissolve the baking soda and warm the lamb, making it easier to mix. 4. Mix well and then let the meat rest for at least 30 minutes, covered in the refrigerator. Tip: Use your hands to mix the ingredients. The baking soda will tenderize the meat, but do not let the meat rest more than four hours, or the meat will turn to mush. 5. While the meat is resting, chop the cilantro and mint. Slice the onions and make the sauces. Tip: Take 10-12 bamboo skewers and put them in a pan of water for 30 minutes. 6. Start the barbeque. Use 30-40 briquettes. Tip: When you lay out your coals you will want them a single layer over the entire grill. 7. Take two tablespoons of the meat mixture and form them into small sausages. 8. String three sausages on each skewer and lay them in a baking pan. 9. Mix the olive oil, garlic, sugar, and salt in a small bowl and brush both sides of the sausages with the oil mixture. 10. Lay your skewers directly over the coals and grill for three to four minutes on each side. Tip: Long tongs, or a heat proof glove, is a very useful thing to have when you are turning your skewers over the hot coals. 11. Transfer the kofta to a plate and tent with foil to keep them warm. 12. Serve the kofta with the vegetables, sauces and lavash on the side. 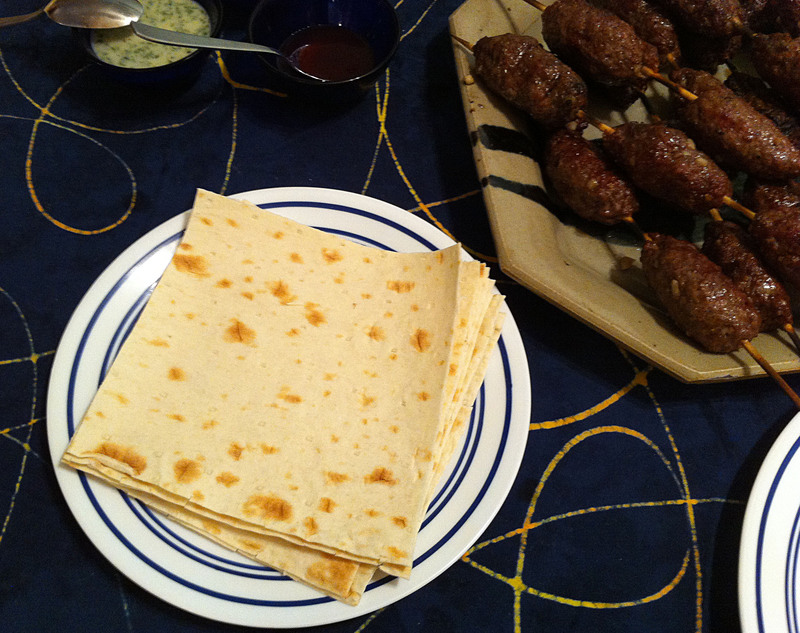 Note: Your dinners hold a sheet of lavash in one hand and place one or two kofta across it. Then they may add cilantro, mint and onions, as it pleases them. They can drizzle one or more of the sauces over the meat and vegetables. Finally, they roll up the lavash and enjoy.